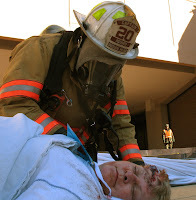 In Part 1 of this series I talked about what moulage is and its important mission in today’s military casualty simulation training environments. 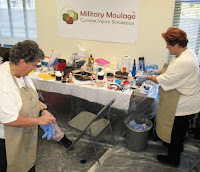 Moulage is also a didactic element in training civilian EMS providers and frequently utilized in their EMS testing environments for certification courses. Our sister company, TraumaSkin FX, is rapidly becoming the product line of choice by the military because of its unique collaboration of skilled silicone artisans and experienced military combat medic instructors. They bring together the best in tactical and technical expertise to produce injury simulation prosthetics and body parts designed from actual case battlefield casualties. They are setting the gold standard as the product line of choice to use on both live actors and artificial medical patient simulators. 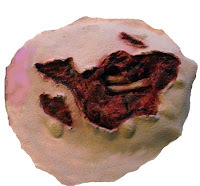 Whatever your material of choice to use for moulage, be it latex, gelatin, wax, or silicone make sure you understand the performance of your materials and it’s interactions for the greatest success in your moulage outcomes. Make sure that y ou understand how to create the injury so that your results will be as close to real-to-the-eye as possible. I have added a few more points below to consider so that you can achieve more accuracy in your moulage endeavors. Remember, realism is your priority, so plan carefully first before you execute to accomplish your goals. **Do not overdo the number of wounds on your casualty. It must look realistic to the training objective, and overdoing on the wounds can a ctually be a distraction. It is fine to add appropriate signs of other body distresses, such as shock, diaphoresis, etc. but be careful that you don’t try to cram too much onto the simulation or you will lose the educational value to ”theatrics”. Quite often, actual body trauma is not nearly as over the top as some moulage artists end up portraying them in makeup. **Use the highest quality materials you can afford. The better the quality the more high fidelity realism you can achieve. I realize that not everyone can afford the silicone prosthetics, but when you consider that silicone is a durable library piece that has an indefinite shelf life the initial cost of it becomes less expensive compared to the cost of materials that are one time use. **Always coach your casualty victim to act out the trauma appropriately. If you are unsure about how to help them portray the part then make it a priority to find out, relative to your trauma, before you begin the moulage process. If you don’t bring in the ”third dimension” of reality through acting out the proper distress, then it just becomes a person wearing makeup and you risk a lost effort and inappropriate outcome.